Home Tags Posts tagged with "Selma"
Dizzying rise to fame, turbulent careers and personal dramaa��biopics pack in all of these ingredients about unforgettable personalities, and naturally have Oscar potential. If made well, they are magnificent. Few biopics over the last year or so were memorable (remember Jobs, based on the life of Steve Jobs, and Diana?). But the upcoming months will see tributes to musicians and some that showcase snipers and wrestlers, too. With some movies releasing earlier, youa��ll agree with us that both Channing Tatum (as an Olympic gold medal winning fighter) and Eddie Redmayne (as Stephen Hawking) deserve a shot at the big prize. The story is about Louie Zamperini (Connell), who competed in the 1936 Berlin Olympics and fought in World War II, as part of the US Army Air Force. When his plane went down over the Pacific, he survived the crash and spent 47 days adrift on a raft. But then he was picked up by Japanese troops and taken to a POW camp, where he suffered under the hands of a sadistic guard, Bird. Did you know: Jolie was mesmerised by his brave tale and felt it was just the kind of story she wanted to tell. Zamperini died last year at 97, but before he died she showed him the cut of the film. Known as one of the most lethal snipers in American history, US Navy Seal Chris Kyle (Bradley Cooper) has made it his lifea��s mission to protect his comrades. He is known for his pinpoint accuracy, which helps him save countless lives. The story is a take on modern warfare and how it takes a toll on soldiers. Did you know: Kyle is known to have put a bullet though a human target 1 km away. To play the lead, Cooper had to gain 22 kg. He also loved Kylea��s Texan drawl that he maintained it for three months. 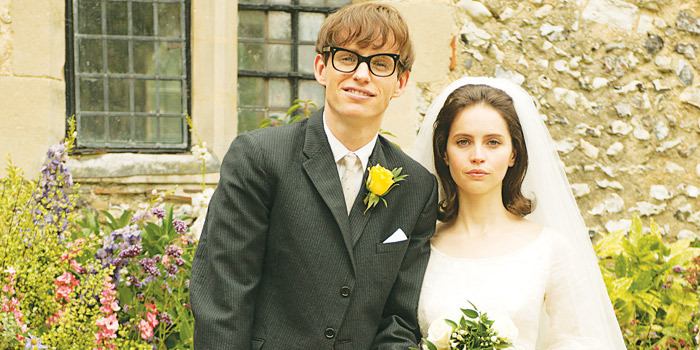 A romantic film rather than a movie on physics, Theory of Everything tells the story of Stephen Hawking, who is struck by motor neuron disease (ALS) at 23 and is given two years to live. Did you know: Redmayne was terrified to play the great man, but on meeting Hawking, found him to be rather mischievous. He spent six months at a motor neuron clinic to recreate the muscle movements accurately. Story: A civil rights drama, it is focussed on the central episode of Martin Luther Kinga��s career: the marches from Selma to Montgomery, Alabama, that he organised in 1965, to press president Lyndon Johnson into pushing for voting rights. Did you know: The project had a hard time finding funding, until Oprah Winfrey (one of the producers), stepped in. She also plays a small role, as Annie Lee Cooper, who is treated brutally during the march. Story: Based on the popular paintings of a�?big eyed girlsa�� that came out in the 1960s. Supposedly the work of Walter Keane, they were actually created by his quiet and shy wife, Margaret Keane. Did you know: Being a fan of her work, Burton was eager to do the film. In fact, most of his films, have taken inspiration from her works. It tells the dark tale of the tragic relationship between a wealthy heir and two champion wrestlers. Olympic gold medal-winning wrestler Mark Schultz (Tatum) and his brother Dave (Ruffalo), are invited by John du Pont (Carell) to move to his estate and help form a team for the 1988 Seoul Olympics. But things turn sour when Du Pont and Schultz feelA�threatened by Davea��s talent. Did you know: Carell was drawn to the film because of director Miller (Moneyball, Capote). He wasna��t sure if he could do the role, but trusted Miller.